John Allen left his home in Boonville, Indiana at the turn of the century, moving to Chicago, Illinois, where his sibling had settled. While working as a salesman in Chicago, John met Frank Miller who asked if he would like to move to Riverside, California, and work for him at the Mission Inn. In 1909 John moved his wife Eva Bryant and his young daughter Melba to Riverside. 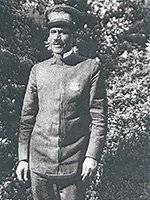 He began his tenure at the Mission Inn as an elevator operator, potter, and later as the branch manager for the Tanner Motor Livery, a new car rental company with an office located in the Mission Inn. He worked at the Inn until 1941 when he was unceremoniously dismissed. John then became a partner with Milton Henson at Master Glaze Auto. He opened a new and used store on East Eighth Street and worked in Truckee, California for the Southern Pacific Railroad Company during the off-season. From 1931 to 1949, John operated the Orange Sweet Shop (“Sweet Shop”) in Lincoln Park. On May 15, 1925, he married Fannie Hopkins in Los Angeles. Their children: Delora Jene, Frances Lorraine, John Hopkins and Columbe Virginia were born in Riverside. In 1948 John ran for a seat on the Riverside School Board against Dr. Carl Cress. He lost; but at the time of his death in 1952, he had filed papers to run again against Dr. Cress.